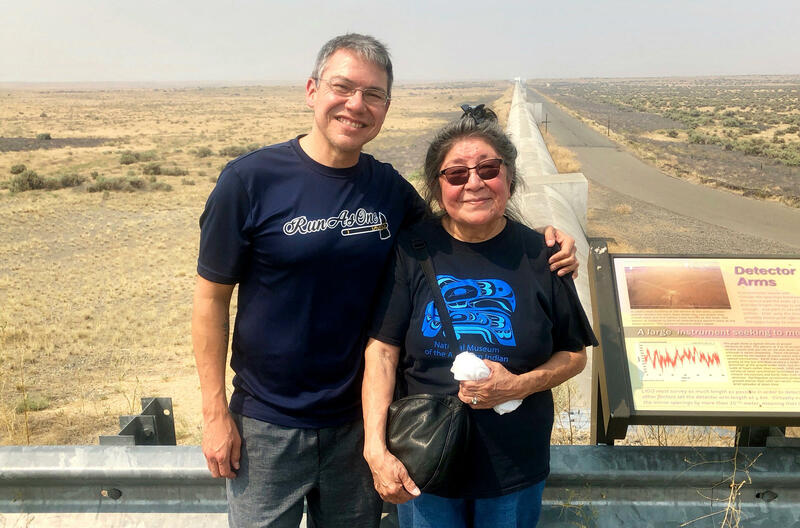 Scientist Corey Gray and his mother, Sharon Yellowfly, are pictured at one of the two massive detectors that make up the Laser Interferometer Gravitational-Wave Observatory. One facility, where Gray works, is in Washington state, and the other is in Louisiana. On April 1, scientists will officially restart their search for gravitational waves after a year spent making improvements to massive twin detectors. Discoveries should soon start rolling in, and when they do, there's a good chance the news will be translated into a Native American language called Blackfoot, or Siksika. That's thanks to Corey Gray, who works at the Laser Interferometer Gravitational-Wave Observatory (LIGO) site in Washington state. He has been collaborating with his mom to translate this cutting-edge field of science into an endangered language spoken by just thousands of people worldwide. Gravitational waves were predicted by Albert Einstein more than a century ago. They're like the ripples in a pond created by a tossed-in pebble, only these waves move through the very fabric of the universe, space-time, and they're created by powerful collisions such as two black holes smashing together. The first detection of these waves — in 2015 — made history. "It was just a life-changing experience when we had that first detection," Gray says. People from around the world were involved in the discovery. So before it was publicly announced, colleagues started translating the press release into about 20 major languages, such as Russian, French and Spanish. "I thought, 'Whoa, wouldn't it be just really cool if we could get this translated into an indigenous language?' " Gray recalls. He doesn't speak much Blackfoot, and he says this is partly because of historical efforts by the U. S. and Canadian governments to stamp out native languages "by taking kids away from their parents and sending them to boarding schools. So my mom is a survivor of that." "Boarding schools were set up to assimilate children," says his mother, Sharon Yellowfly, who grew up on a reserve in southern Alberta in Canada and went to the Crowfoot Indian Residential School. "We went in speaking fluent Blackfoot, and the purpose of this assimilation was to get rid of our language, the customs, the traditions, everything that we grew up with." At these schools, speaking Blackfoot got children punished. "We were forced into speaking English," Yellowfly says. 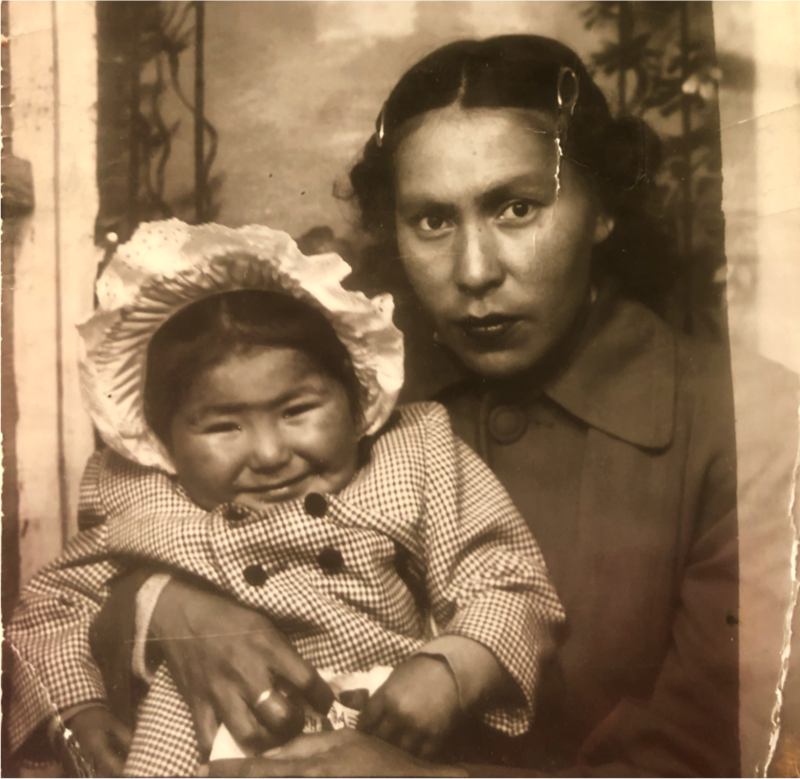 A photo taken in 1953 shows Corey Gray's mother, Sharon Yellowfly, held by her mother, Cecile Yellowfly. This is why Gray wanted to see his family's language represented in a major historic event, and why he asked his mom to translate this gravitational wave announcement. The request came as a shock. "My emotions were all over the place," Yellowfly recalls, laughing. She agreed to try with the help of relatives. She had to create new words for weighty scientific terms such as Einstein's general theory of relativity. That one she translated into a word, "bisaatsinsiimaan," that means Einstein's "beautiful plantings." Gravitational waves became "they stick together waves," or "Abuduuxbiisii o?bigimskAAsts." Other words, such as "black hole" could be directly translated using the Blackfoot, or Siksika, words for "black" and "hole," or "sigooxgiya." Gray loves sharing this effort with younger people. In 2017, his family even sponsored a dance contest at a powwow in honor of the gravitational wave discovery, with traditional grass dancers competing for prizes. "That's the thing I'm really excited about," he says, "just to be able to go and see indigenous youth and youth from my tribe, and just tell them that there is a connection with our language to Einstein now." Meanwhile, as scientists keep detecting more gravitational waves from colliding black holes, or crashing neutron stars, Yellowfly continues to translate the press releases. "I guess I will do these as long as Corey wants me too," she says. "Not only because I do get to work with Corey, but I am honored to meet so many people who are involved with LIGO. I consider these people rock stars." What's more, she says, doing this "is an homage to my parents because they represent the generation that knew more words than I did." This project also has renewed her interest in another project: writing a Blackfoot dictionary. Yellowfly first started jotting down words at the age of 23, after she noticed kids speaking English more and more. "I'm not a linguist," she says. "I had no way of putting things in order." But at the time, she thought to herself, "This needs to be preserved because it is going to be gone at some point, and I wanted to do something for my kids, leave them something having to do with their heritage." She says there's actually a whole Blackfoot language revitalization project going on, led by some of her cousins. Yellowfly stopped working on her dictionary after her parents died because they were her main source of words. But now, she says, this work on translating gravitational waves has made her determined to finish it, for the next generation. Tomorrow, scientists will officially restart their search for gravitational waves after spending over a year improving the massive machines used to detect them. NPR's Nell Greenfieldboyce reports on how this cutting-edge field of science is connected to a Native American language - Blackfoot. NELL GREENFIELDBOYCE, BYLINE: Gravitational waves were predicted by Albert Einstein more than a century ago. They're like the ripples you see in a pond when you toss a pebble in, only these waves move through spacetime, the very fabric of the universe. They're created by powerful collisions like two black holes smashing together. And the first detection in 2015 made history. COREY GRAY: It was just a life-changing experience when we had that first detection. GREENFIELDBOYCE: That's Corey Gray, a physicist who works at the Laser Interferometer Gravitational Wave Observatory in Washington state. He says this discovery involved over a thousand people from around the world, so before the amazing first detection was publicly unveiled, colleagues started translating the press release into about 20 major languages - Russian, French, Spanish. GRAY: I thought, whoa - wouldn't it be just really cool if we could get this translated into an indigenous language? GREENFIELDBOYCE: Like Blackfoot, also called Siksika. It's spoken by only a few thousand people. Gray's mom is one of them, even though when she grew up, the U.S. and Canadian governments were actively working to stamp out native languages. GRAY: By taking kids away from their parents and sending them to boarding schools. So my mom is a survivor of that. SHARON YELLOWFLY: Boarding schools were set up to assimilate children. GREENFIELDBOYCE: That's his mom, Sharon Yellowfly. YELLOWFLY: And the purpose of this assimilation was to get rid of our language, the customs, the traditions - you know, everything that we grew up with. YELLOWFLY: My emotions were all over the place. It was a shock (laughter). GREENFIELDBOYCE: She agreed to try with the help of relatives. She had to create new words for heavy scientific terms like general theory of relativity. YELLOWFLY: And the word that I came up with that was bisaatsinsiiman (ph). And the translation for that is beautiful plantings. GREENFIELDBOYCE: Her son recorded her reading the final translation. YELLOWFLY: (Speaking Blackfoot) Einstein (speaking Blackfoot). GREENFIELDBOYCE: Corey Gray understands more Blackfoot than he can say, but he knows what his mom came up with for gravitational waves - or stick-together waves, as she translated it. GRAY: For that one, I could kind of say it. And I'm probably strangling it. But for that, it's abuduuxbiisii obigimskAAsts (ph). GREENFIELDBOYCE: He loved sharing this with younger people. GRAY: That's the thing. I'm really excited about just to be able to go and see indigenous youth and youth from my tribe just tell me there is a connection with our language to Einstein now. GREENFIELDBOYCE: Meanwhile, as scientists keep detecting more gravitational waves from colliding black holes or neutron stars, his mom continues to translate the press releases. YELLOWFLY: I guess I will do these as long as Corey wants me to. GREENFIELDBOYCE: And doing this has renewed her interest in another project - writing a Blackfoot dictionary. Yellowfly started jotting down words at the age of 23 after she noticed kids speaking English more and more. For years, her parents were her main source of words. She stopped working on her dictionary when they died, but now she says she needs to finish it for the next generation. Nell Greenfieldboyce, NPR News. Transcript provided by NPR, Copyright NPR.